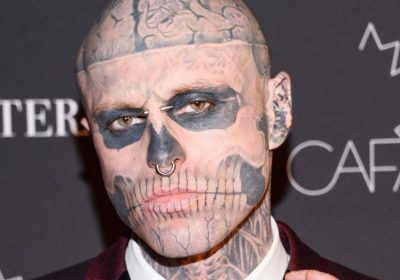 Rick Genest, the heavily tattooed model also known as ‘Zombie Boy’, has died aged 32 in an apparent suicide. His body was found in his apartment in the Plateau-Mont-Royal neighborhood in Montreal, Canada, on Wednesday, reports Radio-Canada. The Montreal-born model, who would have celebrated his 33rd birthday on August 7, got his first tattoo when he was 16 and by the time he was 19, had covered his entire body in ink. After being spotted by Lady Gaga’s stylist, he ended up featuring in the singer’s 2011 Born This Way music video, and from there his fame skyrocketed. He also had bit parts in a number of movies and TV series, including 2013 film 47 Ronin and more recently Silent Witness. After learning of his passing, Lady Gaga took to Twitter to urge others to seek help if they’re suffering in silence. "The suicide of friend Rick Genest, Zombie Boy is beyond devastating," she wrote. "We have to work harder to change the culture, bring Mental Health to the forefront and erase the stigma that we can’t talk about it. The singer continued: "Science tells us that it takes 21 days to form a habit, if you are suffering from Mental Health issue I beckon for today to be your first day or a continuation of the work you’ve been doing. Reach out if you’re in pain, and if you know someone who is, reach out to them too." At the age of 15, the model discovered he had a brain tumour and was told he could die or be left disfigured. "I guess this spiralled me into becoming obsessed with the morbid and macabre," he told the Mirror in late 2016. "As it happened, the operation to remove the tumour went without a hitch, but since then, I’ve known life was too short to not fulfil my dreams of tattoos and body modifications." He had his very first tattoo, a skull and crossbones on his shoulder, shortly after his operation. The model said his nickname, Zombie, was given to him by his pals. "I was then nicknamed Zombie by my friends. When you’re messing around on the streets and getting in trouble, you have a nickname to cover yourself. Zombie came from my love of punk and skulls." He holds the Guinness World Record for his 176 insect tattoos and another for most bone tattoos. Talking about his ink obsession, he added to the Mirror: "I became addicted to tattoos and now have a complete body suit (minus by privates) and a full facial tattoo of a skeleton-style face and zombie-like brain. "It suits me and my journey perfectly." Previously speaking about working with Lady Gaga, he said: "She is really fun and really professional. She gave me a big hug when I met her and she laughed at my jokes. "A lot of people ask me about when I got my first tattoo but she asked me: ‘At what age did you first think about getting your first tattoo?’. "My response was when I was about five or six years old. I liked that question."